Well, it happened again.... What we knew as Release, then Truth, is now Seigler Reels. WTF! The issue has been "tradename infringement." First the folks with Release fighting chairs chased Wes and company over the Release name. Cost of litigation would be well over $100K, so they changed the company name to 100% Truth. That matched the way they did business. But, then comes Truth in Hunting Video's to contest the name Truth - different products, no doubt, but fighting for the right to use the name would again top 100K. Chances are Wes and company would win, but at a cost that makes no one happy but for attorneys. So, we have a new name on the product. SEIGLER REELS is the new name for Truth and Release. Product is the same, WARRANTY the same, ownership is the same, but the tradename changes. I well know what Wes and co went thru on this one, never fun to be embroiled is bs over something so trivial. Well, now the product line goes by the owner's last name, that's something no one can contest or take away! Just what we like to see, some innovative fellows who like to fish with creative minds occupied in designing a better mousetrap...or fishing reel. I had been following Release Reels for 2 or three years prior to adding them to our site & shops May of 2013. They finally have things together, and we're very proud to bring their new gear to your attention. Expect this to be the tip of the iceberg, there are more things planned... 100% Designed, Machined and Assembled in Virginia, USA! In 2015 the folks at Release had to make a decision to change their name. Seems there's another firm making fighting chairs under the Release name. Our reel guys could fight it, and spend upwards of 100K or take the path of least resistance and simply change their name to something more in keeping with who they are. Truth was the name...for about a year before another firm took issue with these folks making use of the word Truth. So, back to building a new name, but not the reels are known entities and very much appreciated regardless of name. Easiest and safest bet, the owner put his name on the sideplate - and that really makes a lot of sense. As a friend of mine from Louisiana once told me, "My dad taught me one rule. The only thing you own is your name, a promise made is a promise kept." (Joe Shabe, New Generation, Baton Rouge 1984) The reels are now known as SEIGLER. Seigler Reels are designed for fishermen by fishermen - now that's an old line, but very true with respect to these guys. Like some of our other favorite firms such as Accurate, Tiburon and of course Avet, these guys have a machining background and they took those skills, a dream and turned their concept and applied creativity into creating a new fishing tool for us. In 2014 Truth/Release moved to a new larger facility, expanded their machining capability with some additional hardware and CNC machines and set the stage for future growth. From the first reels we received I've noticed continued improvement in the subtle areas we wanted to see. They added a dog to the bearing for the anti-reverse, improved freespool performance and in 2014 created a new soft grip round knob that's both unique and a pleasure to use. 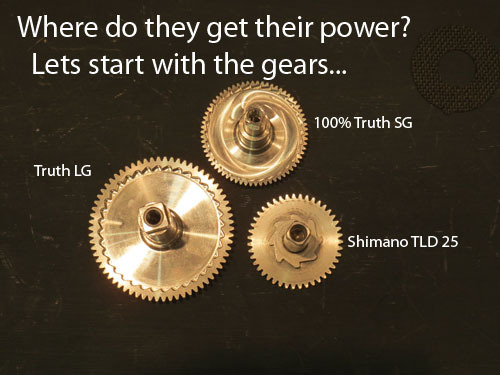 (Note the comparison image of the main gears on the image right - The tiny SG offers a larger and more capable gear than the comparison reel which is quite larger. Larger gears, more precise cuts, more powerful AR - note the cuts on the inside lip of the gears verses near the shaft. By design, greater strength and less slop.). Hi Leeana. This is not a question but a thank you. I have been out fishing 7 times now with the release SG reels I ordered form you folks and have been extremely happy with their performance. Because you shipped them to me fed ex, I received them in time for my extended trip to the coast. Thanks for the excellent service and the great product. These reels are terrific. Whatever they are called, Seigler, Truth or Release, these reels are unique, showing the innovative spirit of their designers and their attention to quality. Their first and smallest reel is the SG. This little powerhouse packs a punch turning 30 pounds of drag! It's certainly made for fishing the new super braided lines, holding 300+ yards of 50# or 400 yds of 40# braid. Many will load up 300 yds of 30-40# and top off with mono. Their drag element is made from carbon fiber, "wet" drag for smoothness of operation. The reels feature BOCA BEARINGS, ceramic bearings with rubber seals on the spool and stainless bearings with stainless steel shields for the rest of the 7 bearings used on these fine reels. Oh, I should note that these are high quality bearings ABEC 5 class, not your basic cheap Chinese bearings that are prone to failure. The reels are light in weight, coming in at 13.5 ounces (12 oz w/o arm), and they feature quick but powerful 6:1 gearing. At ICAST in July 2013 Seigler (Release in those days) previewed their LG (large game) reel. Similar overall design, gear ratio, and features. The primary difference is line capacity, with the larger reel holding 500 yds of 80# Braid and turning up to 40 lbs of drag. There are some nice machining features you'll note, the frame for instance is "bowed" meaning there's more clearance should you not level your line properly in the excitement of reeling in a good fish. The reel foot is uniquely wonderful in my opinion, it's very much knurled/contoured - not a flat piece of aluminum - so it provides a much better fit on most rods as it contours around the reel seat smoothly. You'll also note that the reel does not appear to be ported for water drainage. Well, that's not quite so, actually the entire gear case provides drainage without vacuum with adequate clearance running it's entire length at the base. Uniquely the preset has click stops, detents throughout its range. For 2016 (current) production, all reels now feature a strike position on the lever - nice! The gears are made from Stainless Steel, and they too will wear and become even smoother over time. ***For 2015 Release updated the LG series reels to include a strike button! That's good news for many of us. The SG also incorporates the feature - all reels under the Truth name have this feature now. Seigler reels carry a LIFETIME WARRANTY, that's another unique feature in the fishing industry. They will handle any fishing related product failure for a $20 bill - to cover return shipping and insurance. Product failure is not an option. The SG - Small Game reel is now everything we'd hoped for. Many upgrades from the first production, much more refined, nicer machining...all the things you'd expect from a company committed to bringing fishermen excellent tools for better fishing. The LGN above, a great reel for both private boat trolling, jigging and casting. The LGN could well be one of the best reels made for use on a jig stick tossing iron long distances. NEW LGN (narrow) pictured above. Reels are available in gunmetal with red or gunmetal with blue. They are also manufactured in gunmetal with silver. FREE MONO SPOOLING, FREE SHIPPING! The SM is a long distance surfcaster, made for chucking relatively heavy rigs a long, long way. They feature star drag rather than lever drag. In small part they are based upon the SG (small game) reel from Release. They are made for long distance casting, 150-200 yard casts! The drag is made from carbon fiber, gears are stainless steel, and the ergonomics are right on target for comfortable fishing from this compact and powerful reel. "The SM was designed from the ground up to be a performance distance casting reel, plus it also has all of the fish fighting elements we know how to make." said Wes Seigler, Release Reels' President and designer. "Ryan and I sat down together and we went through all of the major distance casting reels and took the best of every reel and incorporated them into the design. The big 'ah-ha moment' for me was when I figured out how to design the foot and side plates so that cross bars were no longer necessary." The SM features an innovative and completely open design which gives you unencumbered access to the spool. The reels offer an innovative design which eliminates the need for cross bars. It's VERY open on top as the picture indicates. It's low profile chassis makes the reel VERY comfortable to fish. The free floating spool produces optimum acceleration and minimal resistance. Like the SG, the capacity of the reel will allow for 300 yds of 20# mono, meaning when spooled with braid you have up to 400 yds capacity fishing 50# braid! Weight is 23 ounces, and you have the free spinning benefit of ABEC 7 Boca Ceramic spool bearings. The main gear is massive, made from 316 stainless steel. Gear ratio is 6:1, so she's quick and the SM is designed to cast 3 to 16 ounces. There's also a fully adjustable magnetic cast control system. And, like all Seigler/Truth/Release Reels, the new SM is backed by an unconditional LIFETIME WARRANTY. We're showing off the SM below in all black form. This is how we try to inventory the product, but it is also available in black with red, black with silver and black with blue trim (star and handle knob in contrasting color). The Surf model pictured above, more information on this unique surf oriented conventional reel can be found in the next section. This is just a teaser to peak your interest... Sorry, will post a new pick once we get some of the new ones in here. The Seigler SS (Small Star) drag fishing reel is a workhorse of a reel. Based in part upon the SM star drag surf reel, the SS offers power and performance. Like the Surf, the SS offers a mechanical spool tensioner (but no magnetic cast control. It features the bridgeless design also found on the SS model. Weight is a mere 16.8 ounces, with 6:1 gearing and a 38 inch per crank retrieve. Max drag is 24 lbs, with ceramic spool bearings ABEC-5's, 4 carbon fiber drag washers. Sorry, will post a new pick once we get some of the new ones in here. For 2017 the price comes down a bit on the SS, now $300. The SM runs $400. Color SM Black SM Black with Red SM Black with Blue SM Black with Silver Only for SM-Surf, reel body black with optional knob and star colored. Expect a brief wait for the color option reels - 2 weeks. Seigler's OS Offshore Lever Drag Reel was developed to fill a rather specialized and narrow application in bluewater fishing. For high speed billfishing, kingfish and other targets, with relatively light line and extended line capacity, the OS may be right up your alley. Pitching a bait, the OS provides very good casting performance. Holding over 700 yds of 20# mono (600-700 yds 80# braid), these reels have the capacity to effectively target larger game on modest sized gear. These are only available in right hand retrieve at present, and the reels run $500. Picture left shows off the "see thru top" of the reel, increasing rigidity while providing a good view of line capacity during a fight. There are several unique aspects to Seigler's design. The spool is stepped, similar to what the manufacturer did on the SGN. This helps prevent mono compaction on the spool, a great idea other manufacturers forget. More strength, eliminates compaction, and improved weight. Gearing is 6:1 on these 4/0 sized reels. That sounds fast for something relatively large in size like the OS, but given it's intended application it makes some sense. Both sails and kings require some speed in retrieve, and speed is more helpful than other aspects of design in this particular niche application. The OS weighs in at 25.8 ounces.